Time for another round of Yvo’s Shorties! This time around two stories that ended up disappointing me unfortunately. 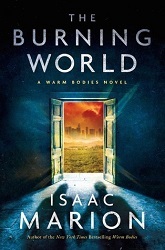 The Warm Bodies sequel The Burning World by Isaac Marion and the ‘impossible to understand why this is horror’ Elevation by Stephen King. I confess I actually read the first book so long ago (three years) that I confused my feelings for the first book with another zombie read. Oops? 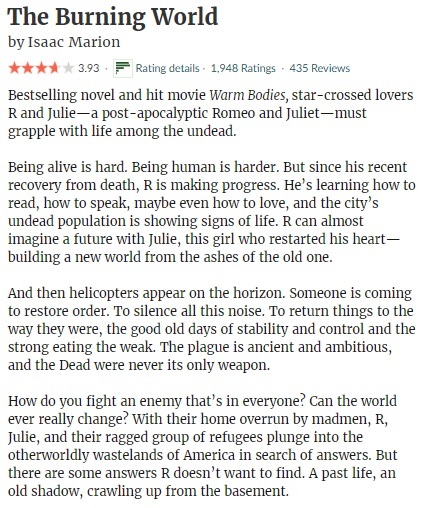 It turns out I wasn’t convinced by the first book Warm Bodies, and sadly this sequel didn’t wow me either. The first thing you have to know before you start the series is that the zombies are not actually scary and they are in fact not the real enemy. That on its own isn’t a real problem, as the idea of having different kind of zombie states is actually quite interesting and original. What I didn’t expect is just how NOT scary either book is. And of course, the romance plays a big role in the story. While I appreciate the idea of a zombie and human being together and all (you can’t deny it’s a slightly disturbing but original idea), it doesn’t lend itself for the most exciting plot. And talking about plots, I found that The Burning World in general lacks a proper plot and that both plot and characters were mostly all over the place and running into random trouble instead of following a coherent line (although things might become clearer in the final book I guess). This wasn’t the only thing I struggled with though, as more importantly I wasn’t a fan of the writing style itself. Especially the WE chapters were frustratingly confusing and there were too many jumps and switches to make for a coherent story. The story was overlong for me with its 500+ pages and I sincerely hope my experience with the final book will be better. I was curious when I saw a new Stephen King was coming out, and I’m sure we can all admit that cover is gorgeous. 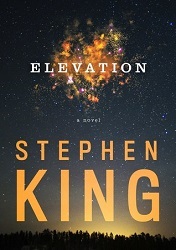 Even though Elevation is a novella and I don’t read a lot of those, I was really looking forward to reading it. The first thing that stands out for me is that I have no clue whatsoever why this novella is marked as ‘horror’. Contemporary romance with a hint of sci-fi and even a far-fetched urban fantasy… Maybe. But horror? I don’t think anyone would find Elevation scary unless you are afraid of hights or stepping on the scale. That was the first thing that went wrong for me. The second thing had to do with the characters. I know it’s only a novella, but the characters just felt like one big cliche for me and didn’t add anything interesting to the story for me. A big problem, as the story is mostly focused on them. I did like the huge focus on the running, but overall there wasn’t really that much of a plot to talk about. Just a guy losing his pounds until he is closer and closer to zero… Not horror, not thrilling at all, and mostly a cliche contemporary story on how one person’s doom can bring other people together. And mostly just a meh story for me. Time for another round of Yvo’s Shorties! 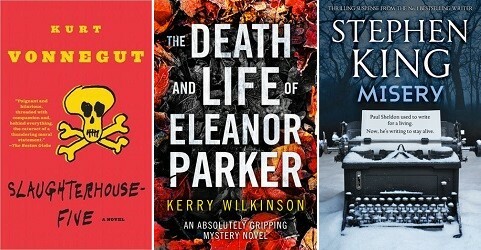 Another round of backlist titles, and two completely different genres and age groups at that. I’ve been meaning to read Misery for years and I already had an idea what it was about… I’m definitely glad I finally did so. 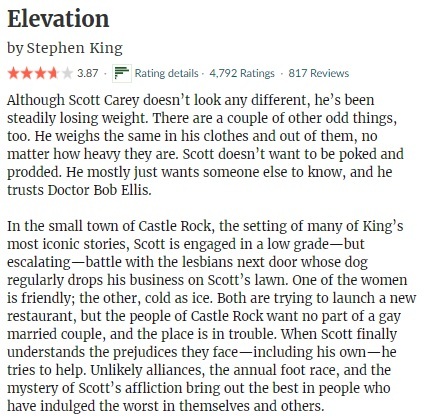 It’s not my all time favorite Stephen King, but without doubt a great read. 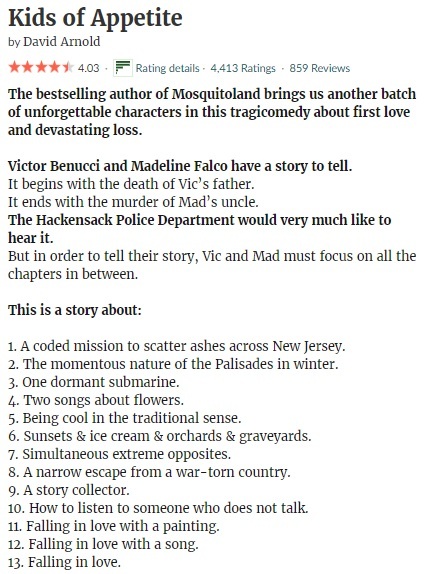 Kids Of Appetite I picked up on a whim browsing my kindle, and I had high hopes because I adored David Arnold’s other book Mosquitoland. Sadly, this story just didn’t work for me. 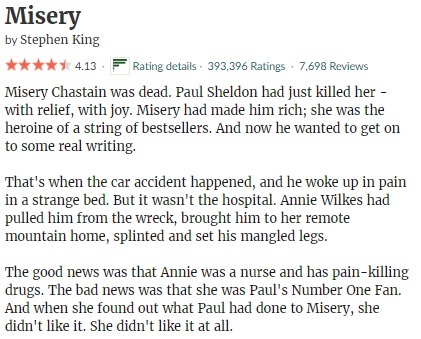 I’ve read quite a few Stephen King books over the years, but somehow I never actually picked up Misery until now. Of course I have heard lots of things about the plot, so I had a general idea what the story was about… And I have to say the actual story definitely lived up to expectations. It’s not my absolute favorite King, but there is no doubt that this is one of his better books I’ve read to this date. Misery is more psychological horror than bloody horror in general, although it has a few select scenes that won’t go well with those with a weak stomach. Strong writing… Check. Well developed, disturbing and creepy characters… Check. A healthy dose of suspense… Check. Plot twists… Check. A little torture and blood here and there… Check. I definitely had a great time reading Misery, although it doesn’t feel the right word for a story this creepy. I liked the Misery chapters in between the actual plot, as it added another level and more dept to the plot itself. And I wouldn’t wish Annie upon my worst enemy! Boy, she is a true nutter… Writers, beware. She is stuff nightmares are made of. 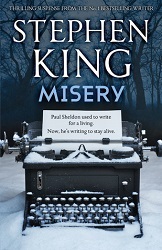 If you enjoy reading his work, Misery should definitely be on your reading list as well. 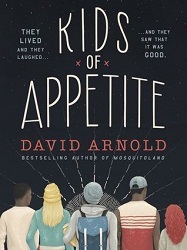 I absolutely adored Mosquitoland last year, so I had high hopes for Kids Of Appetite as well. It took me longer than expected to finally get to it… And sadly it wasn’t the experience I was hoping for. I’m actually still surprised and I bit shocked by my reaction to be honest… Because I have to be sincere here and I’m not sure how I made it past the 20% without giving in to the urge to DNF. Do I feel sad? Yes. But unfortunately Kids Of Appetite just wasn’t for me. I have seen this story has pretty extreme reactions, people either loving or strongly disliking it, so definitely don’t give up on it yet if you enjoy stories with unique characters and writing style. Because that’s the main struggle here: the writing. While unique and original, it is something that either works for you and makes you want to sing out loud, OR makes you want to throw things at the wall in frustration. Not that my singing would actually make anyone happy in the first place, but sadly my walls might have taken a hit or two here. I personally really struggled with it all and this made it just really hard both to get a proper feel for things and understand what is exactly going on in the first place. David Arnold is a master in greating unique characters though. Kuddos to him for introducing us to Victor and giving Moebius a spotlight; the other characters definitely weren’t bland either. I’m not sure everything in the plot was actually credible though. 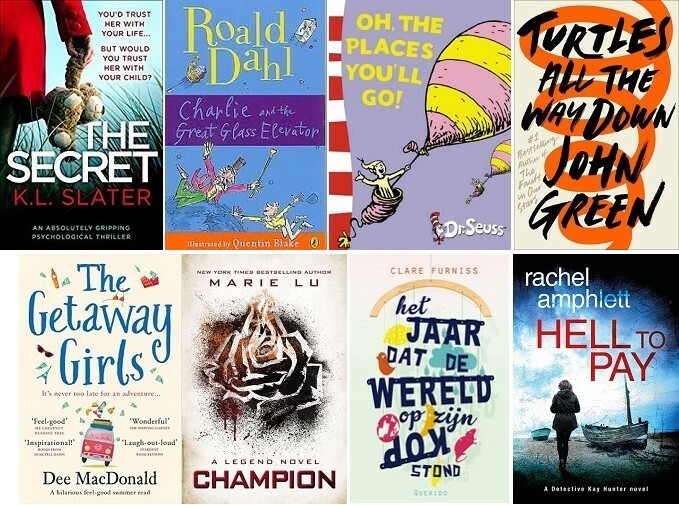 In short, Kids Of Appetite is a book of extremes and therefore will provoke strong emotions… So even though this book didn’t work for me, you might just love it instead. I’m still reading Hunted by Meagan Spooner… Mostly because I decided to finish my previous TBR jar pick first. 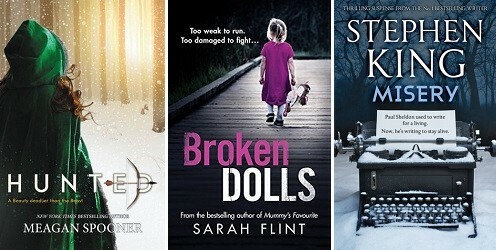 I’m also starting with another ARC: Broken Dolls by Sarah Flint. I didn’t realize when I requested it it was part of a series, so fingers crossed it won’t be too difficult to follow the plot. I also started Misery by Stephen King last week, but I’ve put it temporarily on hold as I couldn’t get a proper feel for the writing style after a few pages. I think Slaughterhouse-Five and me simply got off on the wrong foot. So it goes. It’s not the story, it’s most likely me that’s the problem here. So it goes. While I can completely understand why so many people have so much love for this story, and I can also understand why this is a modern classic, somehow this story just didn’t work for me. I highly enjoyed the historical aspect of the story and the parts set during WWII. I could have handled the time travel elements as well, since they do add dept to the story… But add aliens to the mix and sign me out. So it goes. This story is definitely something different! I’ve enjoyed his work in the past, and while going down a different road with this story, the writing is just as solid as ever. The plot itself is fascinating and quite original. Ever seen the movie Death Becomes Her with Bruce Willis, Goldie Hawn and Meryl Streep? The main character of this story would be a teenage version of Goldie or Meryl, then mix the story with a murder mystery and add a dose of teenage drama: an improvised recipe for The Death And Life Of Eleanor Parker! Could I have done without the love triangle? Yes please. Did certain aspects of the behavior of the main characters annoy me? Without doubt. But I was so intrigued by Ellie’s situation that I was able to forgive the story for it. If you are looking for interesting and cute patterns to brighten up your child’s bedroom or gift something adorable to someone else, you will be in for a treat. There are patterns for beginners as well as advanced crocheters, indicated accordingly. There is even advice for left-handed crocheters like myself, which is highly appreciated. This book uses US terminology, but there are useful conversion charts included if you need to convert to different terminology. In the back, stitches are explained clearly with pictures, helping you understand which is which. 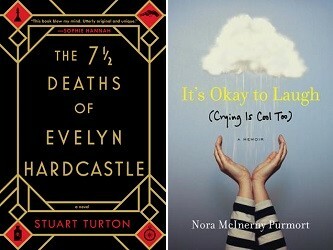 This memoir was my previous TBR jar pick and I title I’ve had on my kindle for over two years now. It is without doubt a difficult read with a difficult theme and in a way I’m struggling to review it. I feel I cannot judge such a personal struggle in any way, but what I can say is what I thought about the story itself. First of all, the pace is quite slow and the story dragged at points; it took me a lot longer than expected to reach the final page. I liked the switches in POV, which made it a bit easier to see both sides of the addiction and its consequences. As I’ve been saying I need to read more Agatha Christie, I’m going to start with Hercule Poirot book number one The Mysterious Affair At Styles. I also have a pending August ARC lined up: Run And Hide by Alan McDermott. 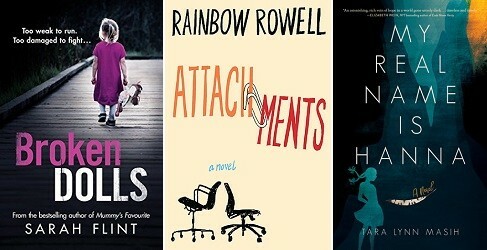 And as part of me trying to read all the books on my monthly TBR for the second month in a row, I want to pick up Attachments by Rainbow Rowell. My new TBR jar pick is An Officer And A Spy by Robert Harris.